Both BSDL and BSSL have a broad substrate specificity and, like CDL, are capable of hydrolyzing triacylglycerides (in addition to phospholipids, esters of cholesterol, and lipid-soluble vitamins). In particular, they can hydrolyze esters of the essential fatty acids (n-3 and n-6 PUFAs) and DHA. BSDL production in the newborn pancreas is quite low when compared with production in the mammary gland or adult pancreas. However, newborn infants absorb lipids relatively well, considering the low level of CDL and BSDL they produce. This observation has led to the suggestion that BSDL produced by lactating mammary gland and present within milk, may compensate for the low levels of other TG-digesting enzymes and aid newborns in lipid absorption. The importance of BSSL in breast milk for the preterm infant nutrition was suggested at 2007. It was also directly shown recently. ↑ Swan JS, Hoffman MM, et al. (1992). "Two forms of human milk bile-salt-stimulated lipase". Biochem. J. 283 (1): 119–122. PMC 1131002 . PMID 1567358. 1 2 Lombardo, D. (2001). "Bile salt-dependent lipase: its pathophysiological implications". Biochim. Biophys. Acta. 1533 (1): 1–28. doi:10.1016/S1388-1981(01)00130-5. PMID 11514232. Murasugi A, Asami Y, Mera-Kikuchi Y (2001). "Production of recombinant human bile-salt-stimulated lipase in Pichia pastoris.". Protein Expr. Purif. 23 (2): 282–288. doi:10.1006/prep.2001.1509. PMID 11676603. ↑ Sbarra V, Bruneau N, et al. (1998). "Molecular cloning of the bile salt-dependent lipase of ferret lactating mammary gland: an overview of functional residues". Biochim. Biophys. Acta. 1393 (1): 80–89. doi:10.1016/S0005-2760(98)00067-8. PMID 9714751. ↑ Andersson Y, Sävman K, et al. (2007). "Pasteurization of mother's own milk reduces fat absorption and growth in preterm infants". Acta Paediatr. 96 (10): 1445–1449. doi:10.1111/j.1651-2227.2007.00450.x. PMID 17714541. ↑ Maggio L, Bellagamba M. et al. A prospective, randomized, double-blind crossover study comparing rhBSSL (recombinant human Bile Salt Stimulated Lipase) and placebo added to infant formula during one week of treatment in preterm infants born before 32 weeks of gestational age. Kumar BV, Aleman-Gomez JA, Colwell N, et al. (1992). "Structure of the human pancreatic cholesterol esterase gene.". Biochemistry. 31 (26): 6077–81. doi:10.1021/bi00141a017. PMID 1627550. Lidberg U, Nilsson J, Strömberg K, et al. (1992). "Genomic organization, sequence analysis, and chromosomal localization of the human carboxyl ester lipase (CEL) gene and a CEL-like (CELL) gene.". Genomics. 13 (3): 630–40. doi:10.1016/0888-7543(92)90134-E. PMID 1639390. Taylor AK, Zambaux JL, Klisak I, et al. (1991). "Carboxyl ester lipase: a highly polymorphic locus on human chromosome 9qter.". Genomics. 10 (2): 425–31. doi:10.1016/0888-7543(91)90328-C. PMID 1676983. Nilsson J, Bläckberg L, Carlsson P, et al. (1990). "cDNA cloning of human-milk bile-salt-stimulated lipase and evidence for its identity to pancreatic carboxylic ester hydrolase.". Eur. J. Biochem. 192 (2): 543–50. doi:10.1111/j.1432-1033.1990.tb19259.x. PMID 1698625. Lindström MB, Persson J, Thurn L, Borgström B (1991). "Effect of pancreatic phospholipase A2 and gastric lipase on the action of pancreatic carboxyl ester lipase against lipid substrates in vitro.". Biochim. Biophys. Acta. 1084 (2): 194–7. doi:10.1016/0005-2760(91)90220-C. PMID 1854805. Baba T, Downs D, Jackson KW, et al. (1991). "Structure of human milk bile salt activated lipase.". Biochemistry. 30 (2): 500–10. doi:10.1021/bi00216a028. PMID 1988041. Christie DL, Cleverly DR, O'Connor CJ (1991). 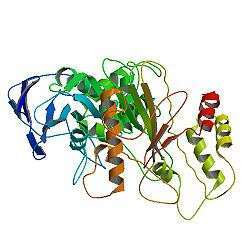 "Human milk bile-salt stimulated lipase. Sequence similarity with rat lysophospholipase and homology with the active site region of cholinesterases.". FEBS Lett. 278 (2): 190–4. doi:10.1016/0014-5793(91)80114-I. PMID 1991511. Reue K, Zambaux J, Wong H, et al. (1991). "cDNA cloning of carboxyl ester lipase from human pancreas reveals a unique proline-rich repeat unit.". J. Lipid Res. 32 (2): 267–76. PMID 2066663. Hui DY, Kissel JA (1991). "Sequence identity between human pancreatic cholesterol esterase and bile salt-stimulated milk lipase.". FEBS Lett. 276 (1-2): 131–4. doi:10.1016/0014-5793(90)80525-N. PMID 2265692. Escribano MJ, Imperial S (1990). "Purification and molecular characterization of FAP, a feto-acinar protein associated with the differentiation of human pancreas.". J. Biol. Chem. 264 (36): 21865–71. PMID 2600091. Erlanson-Albertsson C, Sternby B, Johannesson U (1985). "The interaction between human pancreatic carboxylester hydrolase (bile-salt-stimulated lipase of human milk) and lactoferrin.". Biochim. Biophys. Acta. 829 (2): 282–7. doi:10.1016/0167-4838(85)90199-2. PMID 3995055. Chekhranova MK, Il'ina EN, Shuvalova ER, et al. (1994). "[Cloning, determination of primary structure, and expression of the C-terminal segment of human cholesterol-esterase/lipase, containing the antigenic determinant of the protein, in Escherichia coli]". Mol. Biol. (Mosk.). 28 (2): 464–7. PMID 7514266. Roudani S, Miralles F, Margotat A, et al. (1995). "Bile salt-dependent lipase transcripts in human fetal tissues.". Biochim. Biophys. Acta. 1264 (1): 141–50. doi:10.1016/0167-4781(95)00141-3. PMID 7578248. Bruneau N, de la Porte PL, Sbarra V, Lombardo D (1995). "Association of bile-salt-dependent lipase with membranes of human pancreatic microsomes.". Eur. J. Biochem. 233 (1): 209–18. doi:10.1111/j.1432-1033.1995.209_1.x. PMID 7588748. Wang CS, Dashti A, Jackson KW, et al. (1995). "Isolation and characterization of human milk bile salt-activated lipase C-tail fragment.". Biochemistry. 34 (33): 10639–44. doi:10.1021/bi00033a039. PMID 7654718. Nilsson J, Hellquist M, Bjursell G (1993). "The human carboxyl ester lipase-like (CELL) gene is ubiquitously expressed and contains a hypervariable region.". Genomics. 17 (2): 416–22. doi:10.1006/geno.1993.1341. PMID 7691717. Bruneau N, Lombardo D (1995). "Chaperone function of a Grp 94-related protein for folding and transport of the pancreatic bile salt-dependent lipase.". J. Biol. Chem. 270 (22): 13524–33. doi:10.1074/jbc.270.22.13524. PMID 7768954. Mas E, Abouakil N, Roudani S, et al. (1993). "Human fetoacinar pancreatic protein: an oncofetal glycoform of the normally secreted pancreatic bile-salt-dependent lipase.". Biochem. J. 289 (2): 609–15. PMC 1132213 . PMID 8424803. Shamir R, Johnson WJ, Morlock-Fitzpatrick K, et al. (1996). "Pancreatic carboxyl ester lipase: a circulating enzyme that modifies normal and oxidized lipoproteins in vitro.". J. Clin. Invest. 97 (7): 1696–704. doi:10.1172/JCI118596. PMC 507234 . PMID 8601635. Landberg E, Påhlsson P, Krotkiewski H, et al. (1997). "Glycosylation of bile-salt-stimulated lipase from human milk: comparison of native and recombinant forms.". Arch. Biochem. Biophys. 344 (1): 94–102. doi:10.1006/abbi.1997.0188. PMID 9244386.